Ever since I started to learn Japanese, I’ve done a lot of studying on the train to and from work. At first this meant carrying around home-made paper flashcards and a big English to Japanese dictionary, but these days an iPhone can replace both of those and help you do much more – there are apps for flashcards, for learning the stroke order of kanji, and even fully fledged dictionaries. I’ve downloaded and tried loads of apps, and even created a few, but here’s my personal top five covering everything from basic kana to kanji-lookup. I learned hiragana and katakana before the iPhone existed (sadly – it was a pain), but still need to brush up on my katakana every so often. There are dozens of kana apps, but the best I’ve found come from a Japanese independent developer called Kenji Hioki (hk2006). They are rather large to download, but this is because they’re packed with audio: the app spells out a word (in the screenshot above right, the audio says: “ku – ku – kuruma… kuruma”), while you tap it out using the kana shown on screen. This helps to build up recognition between the sound and forms, while also teaching you basic vocabulary at the same time. 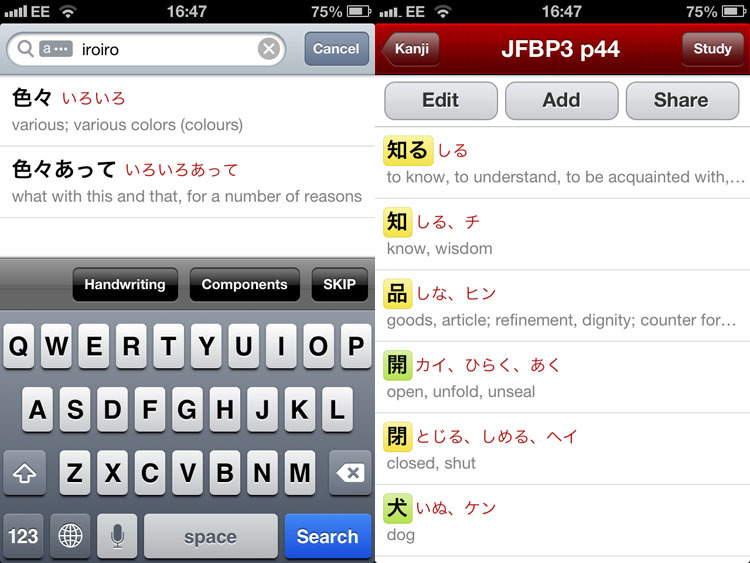 The hiragana and katakana apps are completely free – I also like his Kanji apps as a quick way to revise basic kanji. For vocabulary, I’ve found that nothing works more effectively than flashcards: English on one side, Japanese on the other, so you can learn from Japanese to English first, and then the other way around. There are dozens of flashcard apps, but for me the key thing is ease of adding cards: you need to be able to add them quickly, in bulk, and in either kana or kanji. It’s much easier to do this on a computer, and for that reason I recommend Touchcards 2. This relatively simple flashcards app has one great trick, shown above and to the left: it can import vocabulary from a Google Docs spreadsheet. This means you can easily create and manage huge lists of vocab, then sync them onto the iPhone to learn when you’re out and about. That function aside, it’s simple and to the point: you can study cards in both directions, customise the size of the text, study in order or at random, and enable a scoring system when you want. Only a few years ago I had a big, heavy paper dictionary and was tempted to buy a Canon Wordtank. Now, I just use the appropriately named Japanese, by CodeFromTokyo. This great dictionary app is ideal for looking up words by sound (as shown above, you can type phonetically in roman letters), or kanji (by component, SKIP, or handwriting). 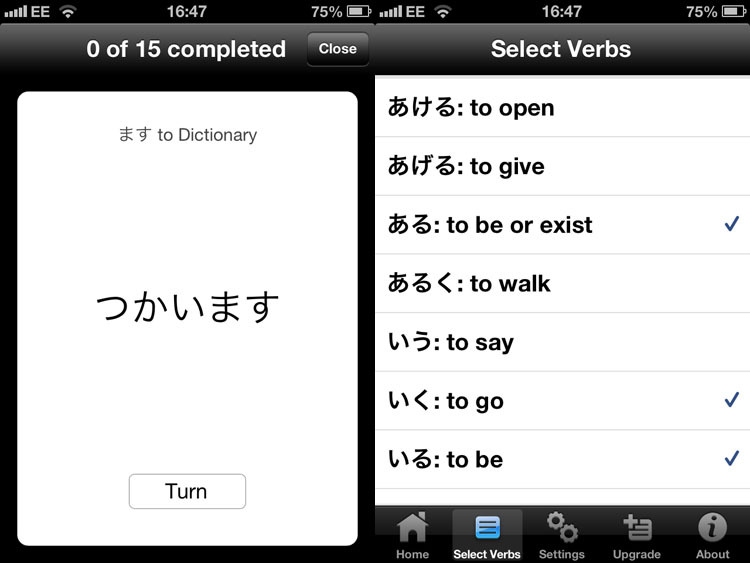 It also has a handy lists function (shown above, right), and an extensive flashcard system for learning those. I use this for drilling through kanji – it works for vocab, too, but you can’t set kanji or kana display per item or add cards that aren’t forms in the dictionary. The app costs $10, but that’s ridiculously cheap considering just how much it can do. A huge disclaimer here: I made, and I sell, this app. But the reason for that is that there wasn’t a good one available before. There comes a time – after you’ve picked up kana, and a bunch of vocabulary – where you’ll need to start learning various verb forms beyond the simple masu / masen / mashita / masendeshita ones, and I wanted a way to learn these in a flashcard-like fashion. 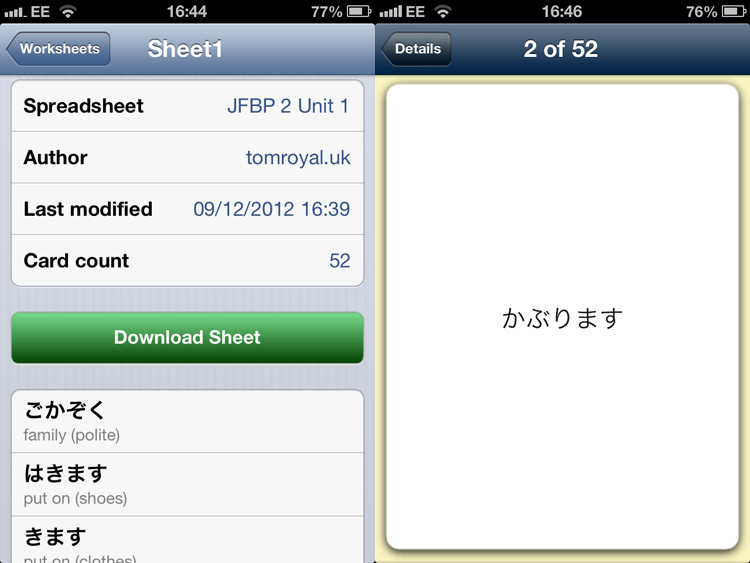 So, here’s my Japanese Verbs app, which does just that. The app is free, with ten basic verbs included, and teaches the masu, dictionary (plain), nai, ta, and te forms of each, along with English translations and classification (Regular 1, 2, irregular). You choose the verbs you want, pick the front and back of each card – English to Dictionary, say – and then drill through the flashcards. A 99c / 69p in-app purchase unlocks 35 more verbs, covering most basic tasks. A second app teaches transitive and intransitive pairs. So those are the Japanese apps that never leave my iPhone. If you’ve got a recommendation for another I should try, please leave it in the comments below or tweet it to @tomroyal.